Who is R3 Stem Cell?IRB ResearchWhat You ReceiveWhy Partner with R3? R3 Stem Cell’s Partnership Program puts your practice front and center in a competitive regenerative medicine marketplace. The All-in-One program will add on to your practice cutting edge stem cell and PRP procedures so better nonoperative outcomes can be achieved along with a new revenue stream. We offer exclusivity to our Partners for their area, IRB approved research participation, and comprehensive marketing for patient acquisition. 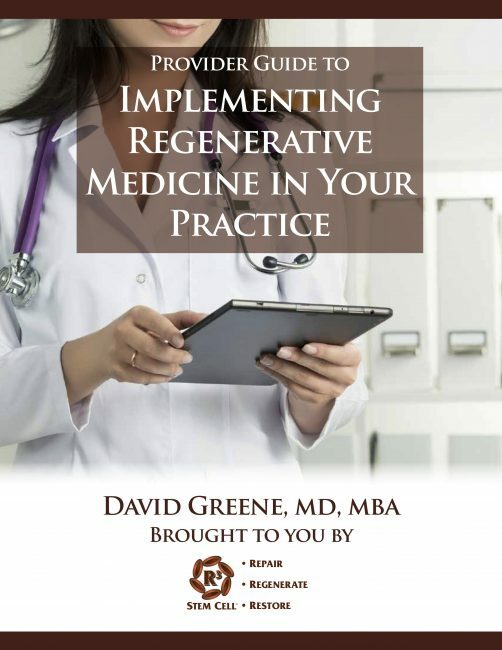 After all, what good is a regenerative medicine program without a steady stream of patients! For the past four years, R3 Stem Cell has been marketing extensively nationwide to let people know their options nonoperatively with the newest therapies. This includes press releases, videos, paid advertising, retargeting and our extensive online library. We offer in-office customized brochures and posters as well. Let us carve out an exclusive geographic area for your practice with a dedicated microsite for your practice. We will market and schedule for you and even assist with sales training and seminar presentations! 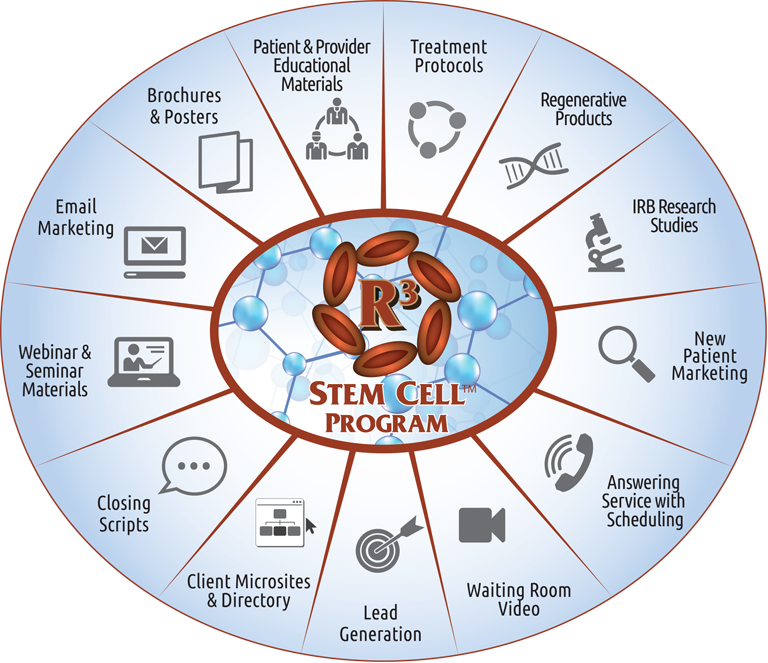 R3 Stem Cell has integrated a scheduling platform into our online websites. Our partner practices provide us with scheduling days and times. Our system will then offer those options to interested prospects. Once a person schedules, our email marketing program will take over. Educational emails and appointment reminders will be sent. This pre-appointment education will assist in conversions and limit the question count during the visit. R3 Stem Cell has performed the heavy lifting to obtain an IRB approved protocol. All partner practices are added to the study. This will enable practices to provide patients with confidence that they are being properly protected in a professional manner. The IRB protocol adds a layer of enhanced reputation as well. We have developed a proprietary web application for patients to complete at regular intervals. R3 Stem Cell takes care of this and our data will be utilized to produce research papers. Partner investigators may be co-authors if desired. More so than any other regenerative medicine company, R3 Stem Cell is focused on patient education. We have developed an online library of articles and videos discussing regenerative medicine indications, outcomes and options available. This also includes provider treatment protocols, provider specific videos and a research compendium for review. In addition, we have licensed a waiting room video that is amazing for patient education! R3 Stem Cell’s product portfolio includes multiple amniotic derived products. This includes amniotic membrane products, cryopreserved fluid and PRP kits that produce the highest concentrations in the industry. Our partners receive volume discounts, amazing customer service, and access to our Network of physicians to exchange best practices! R3 will do ALL the heavy lifting to get your regenerative program going. Once the agreement is signed, our dedicated startup personnel will work with your office to get the ball rolling! This will include sales training, your own micro-website, customized brochures, your waiting room video, posters, access to your portal and more. Get your exclusive geography today, Sign up before your competition. The information provided by R3 Stem Cell is not a substitute for professional medical advice, diagnosis, or treatment. Individual results may vary and only your medical professional can explain all the risks and potential benefits of any treatment based on your circumstances. R3 Stem Cell doesn't recommend or endorse any specific tests, products, procedures, opinions, or other information that may be mentioned on this website. Reliance on any information provided by R3 Stem Cell, it's employees, others appearing on this website at the invitation of R3 Stem Cell, or other visitors to the website is solely at your own risk. R3 Stem Cell is not responsible for the outcome of your treatment.